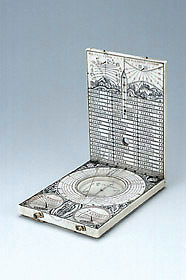 The outer side of this dial has a wind rose with 32 directions and the types of weather in German. There is a brass arm, counterchanged and with Gothic style ends, and a compass viewing hole. In the spandrel spaces are four gilt brass triangular plates with faces of putti. The inner side of the upper leaf has two pin gnomon dials, the left one inscribed 'DIE [star] TAG [star] LENG [star] [star] [star]', with the length of the day numbered in red from 8 to 16 and the declination of the sun with the symbols of the zodiacal signs. The dial on the right-hand side is inscribed 'DIE PLANETEN STVNDT' and with planetary hours numbered from 1 to 12 in red. Under both dials are city landscapes. In the centre of the leaf are holes for adjusting the latitude to 54?, 52?, 48?, 45?, 42?, 39? and below is a list of 54 cities and latitudes. On the very bottom of the leaf is a geometrical decoration. The inner part of the lower leaf has a compass (ring missing) with the cardinal points named (noticeable is the mis-spelling 'SEPTENERO'), four blowing faces and an indication of magnetic deviation. Around the compass is the string gnomon dial, for the aforementioned latitudes. The circle for 54? has hours numbered from 4 to 12 to 8 with lines and dots for the half and quarter hour, and has the maker's mark (a crown) punched twice at the bottom. All the other circles have three dots each hour to ease reading. In the top spandrel spaces are two putti faces and below the dial is a figure of the Virgin and Child. On its sides are two similar scaphe dials with a sun face on the bottom, indicating Italian hours numbered from 8 to 23 (on the left) and Babylonian hours numbered from 1 to 16 (on the right). The remaining space is filled with flower decoration. The outer side of the lower leaf had a lunar volvelle (the hour lines are engraved but the actual brass volvelle is missing), with a table of epacts for the year 1612. Around the circles is a concentric oval filled with arabesque decoration. As in the other leaf, the spandrel spaces have four gilt brass plates decorated with putti.